on September 14, 2017, 3:18 p.m. This week, Paul Price takes over at Topshop after the brand’s former CEO, Mary Homer, moved to The White Company. He takes charge of one of the biggest names on the UK high street at a time when its parent company, Arcadia, experiences a drop in sales across its stable of retail brands (including Burton, Dorothy Perkins, and Miss Selfridge). YouGov BrandIndex data demonstrates some of the challenges Topshop faces on the UK high street, online, and overseas. 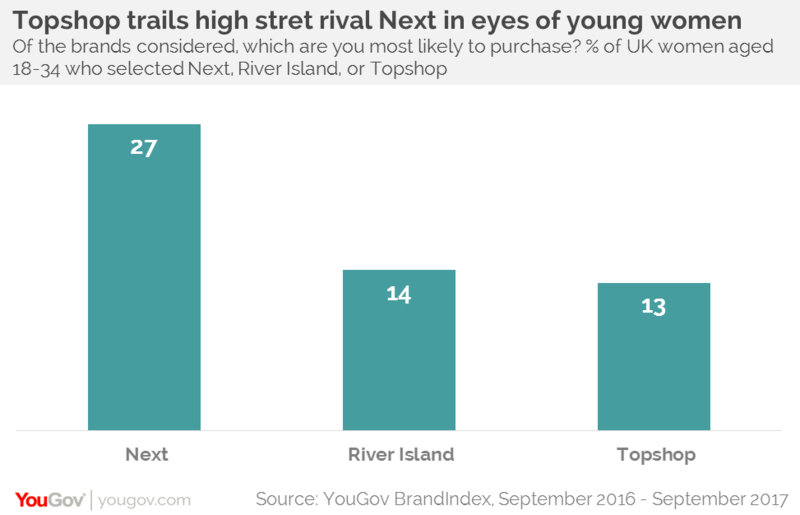 Looking at Topshop’s overall brand health among its core consumer base – female consumers aged 18-34 – compared to some of its high street rivals, Next and River Island, we see that while Topshop and River Island share similar scores throughout the last year, both lag behind Next. Mr Price, who was previously chief merchandising officer at Burberry, arrives at a time when high street spending is under increasing pressure from online sales. Looking again at the brand’s core audience – young women – in this area, it is again apparent that the brand’s incoming CEO has his work cut out. Topshop faces a strong challenge online from the likes of ASOS. 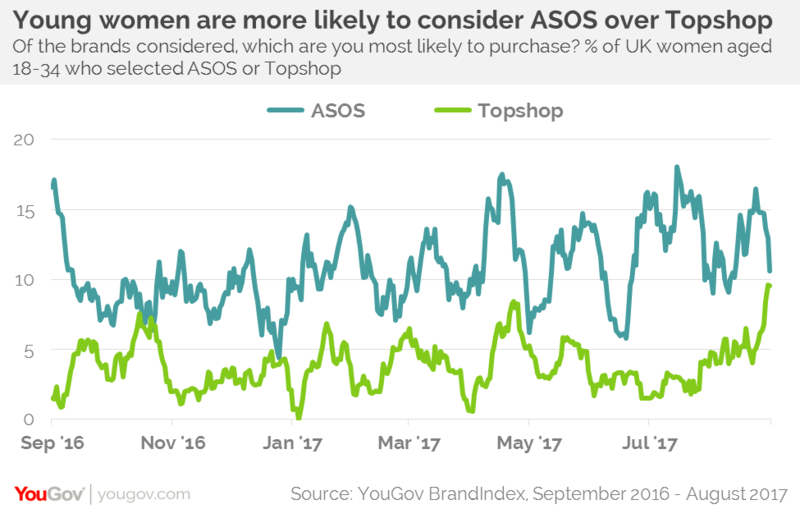 Although Topshop’s purchase consideration recently reached its high point for the year, online-only ASOS still maintains a notable advantage over its high street rival. In recent times, Topshop’s global expansion has also run into some difficulties. In the year to August 2016, international revenue fell by 6% and over the past few months the brand’s local partner in Australia fell into insolvency. 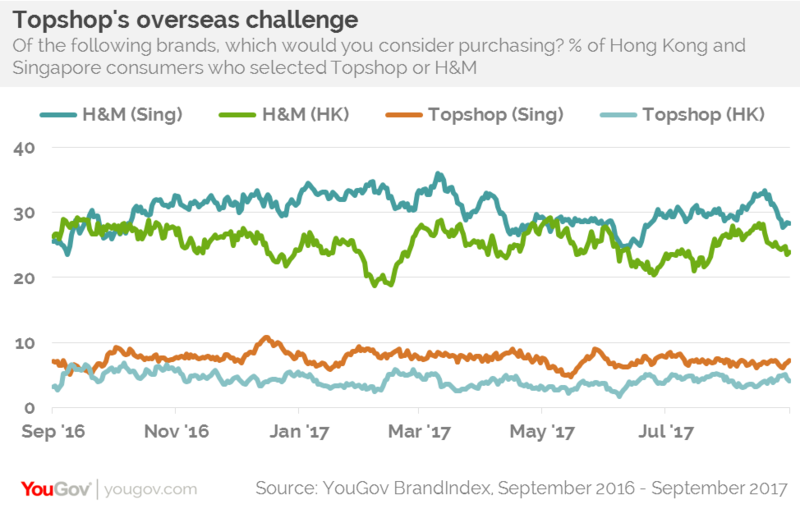 The scale of the challenge facing Topshop’s APAC expansion is shown by the significant lead an established global brand like H&M has when it comes to consumers’ purchase consideration in two of Asia’s most developed markets. In both Hong Kong and Singapore H&M enjoys double-digit leads over the British brand. It will be interesting to see the extent to which Topshop’s new CEO can make progress among consumer sentiment when it comes to its domestic high street rivals, its online competitors and its overseas competition.